This book explores the transition from oral to written history now taking place in tribal Jordan, a transition that reveals the many ways in which modernity, literate historicity, and national identity are developing in the contemporary Middle East. 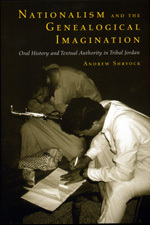 As traditional Bedouin storytellers and literate historians lead him through a world of hidden documents, contested photographs, and meticulously reconstructed pedigrees, Andrew Shryock describes how he becomes enmeshed in historical debates, ranging from the local to the national level. The world the Bedouin inhabit is rich in oral tradition and historical argument, in subtle reflections on the nature of truth and its relationship to poetics, textuality, and power. Skillfully blending anthropology and history, Shryock discusses the substance of tribal history through the eyes of its creators—those who sustain an older tradition of authoritative oral history and those who have experimented with the first written accounts. His focus throughout is on the development of a "genealogical nationalism" as well as on the tensions that arise between tribe and state. Rich in both personal revelation and cultural implications, this book poses a provocative challenge to traditional assumptions about the way history is written. Andrew Shryock is Assistant Professor of Anthropology at the State University of New York, Buffalo.